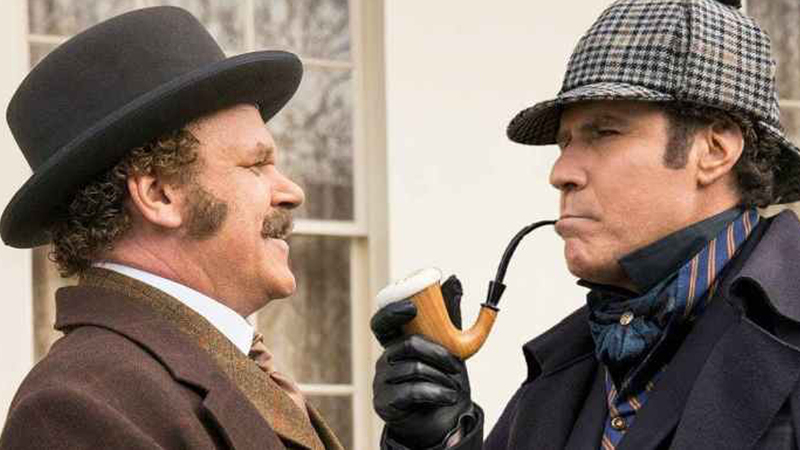 Will Ferrell and John C. Reilly – the legendary duo from Step Brothers and Talladega Nights – reunite in Holmes & Watson, a unique and comic take on the world’s greatest detective, Sherlock Holmes, and his faithful companion, Dr. John Watson. The game is afoot, or “a going,” as Holmes proclaims, when a dead body is discovered in Holmes’ birthday cake at Buckingham Palace. It seems the perpetrator is their longtime nemesis, criminal mastermind Professor James Moriarty (Ralph Fiennes), but the famed sleuth has doubts. As their investigation uncovers one twist after another, Holmes and Watson face the greatest threat of their partnership. The master sleuth and his dependable partner must remain united to find the killer, save the Queen, and restore the reputation of the world’s greatest crime-solving duo – if the case doesn’t tear them apart first. Conan Doyle was first and foremost a storyteller and while his Holmes tales were not overt comedies, they were always entertaining and fun. So, it’s not too much of a stretch to see the characters and their world reimagined, through the reteaming of Ferrell and Reilly, and the unique voice of writer-director Etan Cohen (Tropic Thunder, Get Hard), as a raucous comedy rife with physical and verbal humor and comic twists and turns, along with murder, mystery, absurdity, pageantry, and a storied partnership that may be on the rocks. Director and screenwriter Etan Cohen graduated from Harvard and received the Comedy Writer of the Year Award at the 2009 Just for Laughs Comedy Festival in Montreal. Throughout his illustrious career, Sherlock Holmes, aided by Dr. Watson, has solved mysteries of unimaginable complexities and intricacies. No subject is beyond his understanding; no conundrum transcends a solution. With one exception: they’re clueless about love and romance, both of which turn Holmes’ razor-sharp intellect into a shapeless pile of goo. For Watson and Grace, it’s love at first … autopsy … as the two characters find themselves growing increasingly hot for one another as they dissect a corpse in a morgue. “Grace is an especially strange character,” says Hall. “She doesn’t see blood and gore as anything but wonderful. She revels in the glory of the human body, which is romantic fodder for her and Watson. “And it was a little surreal because John and I spent the entire day mopping down a really dedicated extra who was pretending to be a cadaver,” she adds. Not to mention that the actress, who is half-British, was playing an American, opposite two Americans playing Brits. 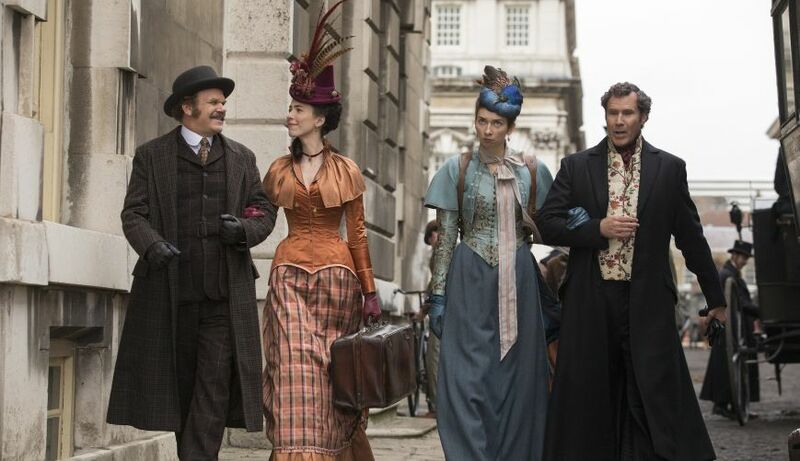 Grace is an independent woman and an accomplished doctor, two descriptions that don’t compute for Holmes and Watson. “Allow me to introduce you to a real doctor,” says Holmes, gesturing to Watson, after Grace identifies herself as a physician. 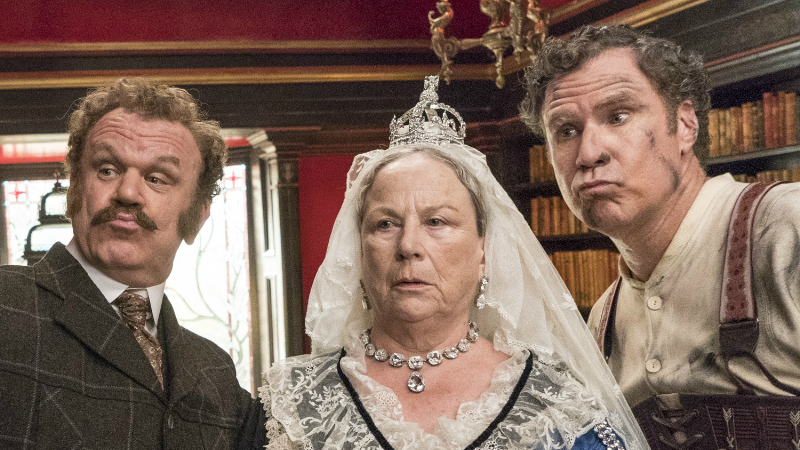 “Much of the humor is mined from those stereotypes in Victorian England, and the fact that everyone around Grace won’t accept that’s she’s a legitimate doctor,” notes Cohen. While Watson is pitching woo with Grace, Holmes is falling under the spell of her travel companion and “research project,” Millicent. “She’s a little bit weird,” understates Lauren Lapkus of her character, who was raised by feral cats, eats paper, and follows absolutely no rules. “It was really easy to become Millicent – I just tapped into my inner-self and was as absurd as possible,” she adds with a laugh. And of course, Holmes, a master of language and intellect, falls for someone who doesn’t speak. But there is an odd kind of logic to it: Holmes is enamored of Millicent because she’s like a blank canvas for him to work on. “Sherlock is so egotistical that he can put all of his thoughts and desires onto her and then imagine all the wonderful things she must be thinking about him,” Lapkus explains. Another character known from Holmes lore is the consulting detective’s landlady and housekeeper, Mrs. Hudson, at the flat he shares with Watson at 221b Baker Street. In the Conan Doyle stories and many of the subsequent adaptations, Mrs. Hudson is a staid, maternal figure, but Cohen again shakes things up here, giving us a Mrs. Hudson who is young, saucy and hot-to-trot. “She’s also a terrible housekeeper,” says Scottish actress Kelly Macdonald, who takes on the role, which is a 180-degree turn from the quiet, introspective characterizations for which she’s been acclaimed – some of which have been housekeepers. “I come from a long line of cleaners,” she says with a laugh. Moreover, Mrs. Hudson’s taste in men is … well, “Let’s just say she keeps interesting company,” Macdonald teases. To that end, Holmes & Watson was filmed entirely in the United Kingdom. The production captured some of the country’s most spectacular and historical locations, including: The Historic Dockyard in Chatham; the Tower of London; Hampton Court Palace; Kempton Steam Museum, on London’s outskirts; and Laredo Ranch, a replica western town set in the heart of the Kent countryside. “You can’t fake the richness of these locations,” says Ferrell. “The set is so incredible you feel like you’re stepping into the [popular London tourist attraction] Sherlock Holmes Museum, which is actually at the real 221b Baker Street,” adds Cohen. In addition to Shepperton, the production utilized another storied facility, Pinewood Studios, on which it built an opulent ballroom on the Titanic, which in the film is setting sail on its maiden – and final – voyage.